As part of their 100 AED Giveaway, AED.com has donated a LifePak CR Plus AED to a mother whose son had suffered cardiac arrest and survived. She will be placing the AED in Livermore High School. You have blessed our students, staff and families with a much needed life-saving device. 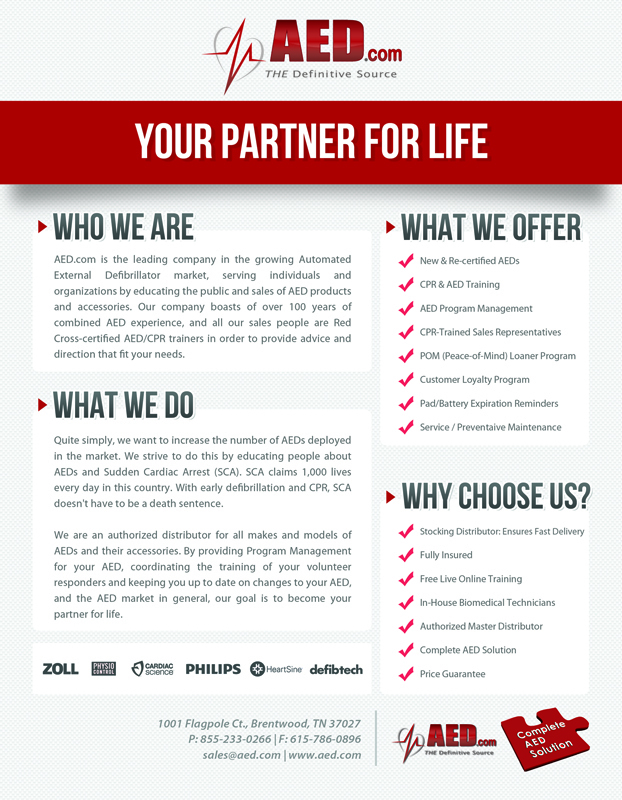 In 2012, AED.com decided to raise AED awareness by giving away 100 Automated External Defibrillators. Thousands of applications were submitted from various organizations and individuals. "Each submission has been different, but a particular letter from Kathy Adelman stood out to the AED.com Donation Team," said Blaire Czarniecki, AED.com Sales Support Administrator. Kathy’s letter explained how her 16 year-old son Nathan, suffered Sudden Cardiac Arrest while sleeping. The family dog sensed something was amiss and started barking erratically at the foot of Nathan's bed, awaking Nathan's brother and prompting him to call for help. Fortunately, there was a fire station located just down the street from the Adelman house and paramedics arrived within minutes. Nathan was defibrillated three times before being taken to the hospital where he fully recovered, but later learned he had Brugada Syndrome, a rare genetic heart condition. Nathan was outfitted with an ICD (Implantable Cardioverter Defibrillator) which is an internal defibrillator attached directly to his heart. He has been saved an additional 10 times with the ICD since his first cardiac arrest. Now with a genuine concern about sudden cardiac arrest in schools, Kathy is on a mission. "Several weeks after I returned to work (Livermore High School, where Nathan is also a student), the nurse and myself made a presentation to our school board pleading with them to implement an AED program," commented Adelman. "My greatest fear is that a mother will have to say goodbye to her child who suffered a cardiac arrest event when the child could have been saved with an AED." AED.com donated a Lifepak CR Plus AED to the Livermore High School in hopes of possibly saving a cardiac arrest victims life. “We are so excited – beyond belief! When I brought Nathan in to show him, he could not stop smiling! Thank you so much, AED.com! You have blessed our students, staff and families with a much needed life-saving device," said Adelman. "As a Mom with a son who has survived cardiac arrest, you will never know how much we appreciate your willingness to donate such a valuable gift."